This past weekend, The Black Mondays drag troupe celebrated our four year anniversary! It was a fantastic show with a great crowd. 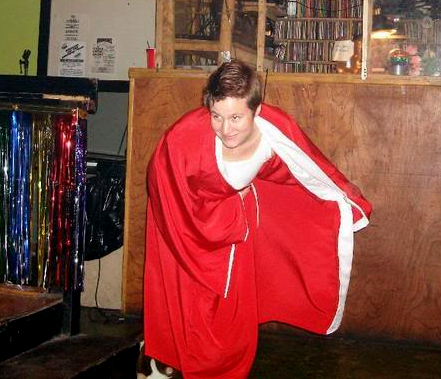 Its hard to believe its been four years since I was an awkward “Jammie JAC” in my bunny slippers, boxers, and home-made kimono robe collecting tips at the troupe’s 2nd show ever. Lol, yes, that is how I got started in drag; collecting tips in my underwear and bunny slippers. I wouldn’t have it any other way. Blast from the past! Drag in Cincinnati has become such a different scene from what it was back then; back when shows were selling out the bar, and the bar next door. Practicing in tiny kitchens and boiling living rooms on the west side, or in the old dive dyke bar until 8am, watching our recorded routines huddled around the the tiny screen of a bulky 1990s camcorder – where now with my Flip camera we record practices and then watch them full screen on a computer a few minutes later. (I don’t know if you can fully appreciate how amazing that is, but trust me it is – hence I randomly put it in this post.) And JAC McFaggin’, the Euro-star who wanted so badly to be a badass king now turned genderfucking crossdresser embracing his gayness – a totally unexpected development, but I couldn’t be more pleased. I am excited to see where the next years will take us in our drag exploits. In the meantime, and speaking of technology, enjoy some fabulous videos! I unexpectedly undertook choreographing “Confessions” from Glee two weeks before the show (which I wasn’t thrilled about, and otherwise would not work with Glee material). Never heard the song, didn’t know a thing about it. We did it as a boys number and I even surprised myself at the butchness of the moves, which in the end I myself still didn’t execute butchly which was expected. Notice all the fists! Masculine! RAWR! More videos to the show can be found at The Black Monday’s YouTube Channel. And the absolute cutest number I have ever put together finally came to life!